When I was young I was shy. Painfully shy. So shy that speaking up was excruciatingly painful for me. The year I turned 30, John and I moved from our birthplace in Indiana to east-central Minnesota, and I vowed to start over in this place where no one knew me; I vowed to stop being a wimp. I devoured Dr. Wayne Dyers’s Pulling Your Own Strings and Your Erroneous Zones, several times in fact, and started speaking up for myself. Still, it was hard. Very, very hard. Then I became Suzanne Bouche. Next spring the historical society’s help wanted ad appeared in the local paper. Could I do it? Could I stand up in front of crowds and talk? I wasn’t sure. But I wrote up a résumé and sent it in. Amazingly, I was hired. Our site manager, Jacques Deseve (known in the mundane world as Dennis Hoffa), handed me a pile of resources, including the 2-inch-thick archaeological site report, a copy of the journal Mr. Sayer kept during his winter stay on the Snake River, costuming materials, and a copy of Many Tender Ties; Women in Fur-Trade Society, 1670–1870. With that I was off and running. I didn’t have a sewing machine and wouldn’t have known how to use one if I did, so I researched period hand-sewing techniques. When the site opened for the year, I owned a hand-sewn, appliquéd Ojibwe strap dress and leggings, hand-sewn moccasins, a period shirt to wear under my dress on chilly days, and red wool strips to wrap my hair. I adopted the name Suzanne Bouche, Métis wife of Bouche, one of Mr. Sayer’s voyageurs. I listened to the other guides (all with many years of experience under their belts) give tours for a week and then, too soon, came my turn. It was awful. I lost my nerve and stuttered and shook. Afterward, I cried. I couldn’t do this! I couldn’t I couldn’t I couldn’t. It came easier and easier. With the help of my new Ojibwe friends, I learned the things Suzanne would know, like gathering birch bark and making baskets, cooking over a fire, and gathering wild food and herbs on site. I also learned that before the white traders’ coming, Ojibwe women were very powerful indeed. I gradually put together my trademark “fur trade feminist” program to give to Native American groups and to mostly female tourist groups. When I gave it to a group headed by Nina Archebal, then director of the Minnesota Historical Society, she proclaimed it one of the best presentations she’d ever seen. I was so thrilled, my moccasins hardly touched the ground. Later, when Jacques left to manage a privately owned but similar site occupied around 1820, I became Margaret Sayer, also known as Shawinigiizhiigokwae or South Sky Woman, daughter of old John Sayer and his Métis wife, Nancy, a.k.a. Obiimowanokwa, or Woman in Charge of Things. During the 7 years I portrayed these women’s lives, I learned the joy of being someone else. I stepped inside those women’s skins and looked out through their eyes, leaving my shy, retiring self behind. What freedom! What joy! And then, when the second site abruptly closed, sadly, it was over. I still wanted to be someone else. What happened next is beyond extraordinary. One day, while discussing Margaret with a close friend, I bemoaned the loss of courage I felt when I put her persona aside. My friend sagely nodded. “You should become a Klingon,” she said. A Klingon? I was a Star Trek fan — but how does one become a Klingon? I borrowed my friend’s Star Trek reference book and wrote to an address I found inside. The contact person, Sue Frank, is a remarkable rabbi from Philadelphia who at the time published a Klingon fanzine called The Agonizer. She and I quickly became friends. One thing led to another, and I, who am just about the last person on earth to become involved with any sort of fandom (we haven’t even owned a television for the past 9 years), became Major K’tura Doqro, head of the Imperial Mounted Guard on planet Kraaxi. 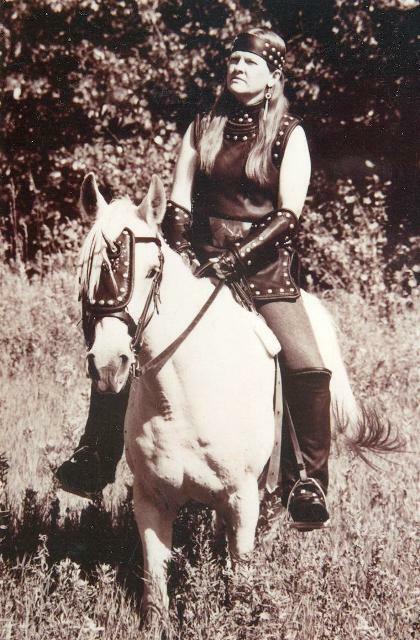 A highly detailed persona set within its own Star Trek universe soon emerged, along with a hand-sewn costume for me and my horse (we wore it on the sly around the farm, not to Star Trek conventions) and a vast amount of fanfic, much of which today makes me cringe. But it was fun, really, really fun, being K’Tura. So here I am, years later, remembering it all with a smile on my face. I’m ready to be someone else again, to sew another costume and look out from another person’s eyes. But whose? I don’t know! I’ll let you know when I find out. Sue, always a joy to read your stories. Thanks! Thank you! I almost junked this entry because I was afraid people would think I'm awfully weird. But I guess I am--and maybe that's not such a bad thing after all. My family and I love to attend the Feast of the Hunter's Moon in West Lafayette, Indiana. It is also based on the Voyagers and the Native Americans who lived in the area at the time. By the way, I don't think you weird at all! I'm a former homeschooling mom (kids are grown up) who loves all things Star Trek. Except I want to be Captain Janeway. I wanted you to know that at the old NWC fort where you portrayed Francois Bouche's wife, you were portraying a real woman, Waussequa, aka Margueritte. Francois Boucher. She shows up in the treaty of 1826, with Francois 'Boutcher'. 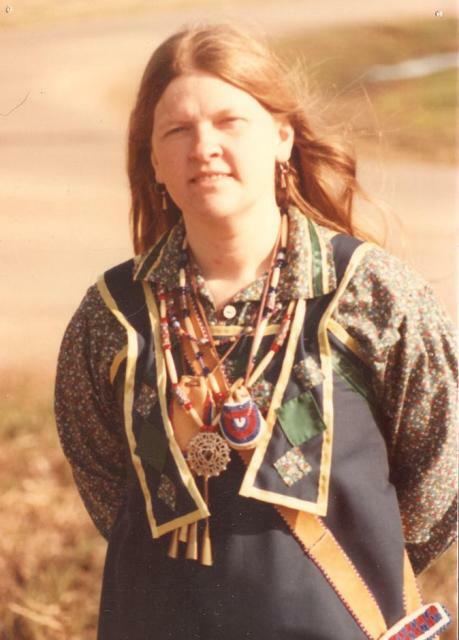 She was a native woman of the Lapointe bands, born and raised at the mouth of the Bad River in WI, and would have been a cousin of Strong Ground, elder brother of Hole in the Day, and also detailed as relative to the Great Buffalo, principle chief of the Lake Superior area ojibwe. I descend from her, and have found Francois at the old Fort St. Louis all the way back to creation in 1793. One of her identified children was conceived just a few months after the conclusion of John Sayer's Snake River Journal in 1805, and one of her younger brothers, was born at the old Fort sometime in 1812, around the outbreak of the war. There is allot more to it, but I thought I would let you know you were channeling a real woman.